Tolmie is a cozy, top-down, in the round sweater with garter stitch edging and a beautiful diamond motif on the front made entirely of knits and purls. Very easy to knit, yet it will surely become a go-to item for early fall through spring. If you are on the short side, it may be a good idea to adjust body and sleeve length. The sample was knit in size S with 6” / 15 cm positive ease. 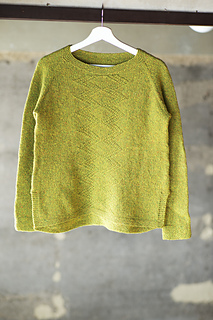 It is a top down and knit in the round sweater. Sleeves are also knit in the round. 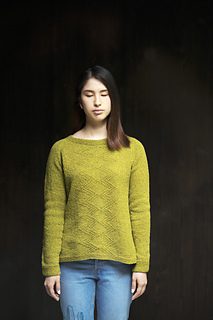 Yoke, hem and cuffs are worked in garter stitch and body and diamond motif are worked entirely in knits and purls. 輪編みのトップダウン セーター . 袖も身頃と同様に輪で 編む. ヨーク, 裾, 袖口はガーターで編み, 身頃はフロント のモチーフも含め全て表編みと裏編みで編む.